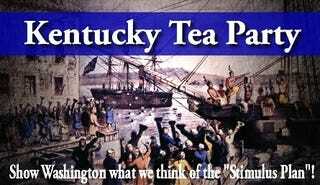 Here's an article about how the Tea Party went after a Kentucky library for daring to raise taxes (by $1) to build a new branch, even though there was a statute in place that allowed them to do so. In response to the Tea Party lawsuit, one Kentuckian mother wrote about the enormous financial benefit her family gained from participating in the information commons. Her family of six visits the library regularly. They have access to over 550,000 books, CDs, newspapers, magazines, movies and video games. The amount of money her family saves by using the libraries' many resources far surpasses the property tax they pay. Revealingly, the Tea Party's vigilance over the dollar we spend for public services doesn't seem to extend to the dollar we spend for private services, even when they are supplied by regulated monopolies. In Kentucky the rates of cable companies, the phone companies, the electric utilities are all subject to government oversight. But when Kentucky utilities recently proposed to increase utility bills ten times more than any proposed library tax the Tea Party was MIA. According to the FCC cable companies raised their prices at twice the rate of inflation from 1995 to 2010, boosting the average household's bill by an astonishing $400 a year. The Tea Party circulated no petitions. Its members filed no lawsuits. Because why would they? I sincerely hope that this is used against Tea Party groups in all states that they hate libraries and are out to destroy good public institutions in the name of government waste.